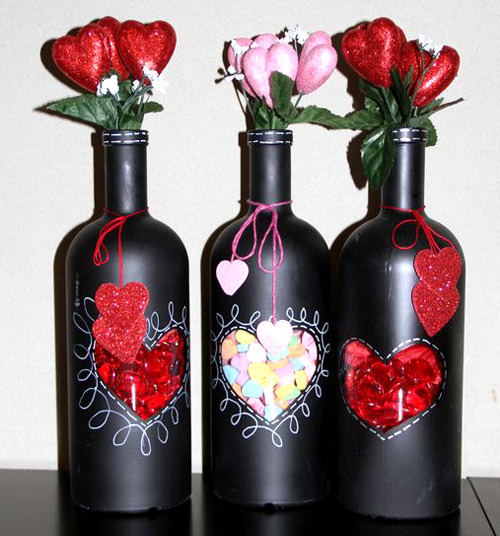 Bottle craft inspirations and decorating ideas for Valentine’s Day. This time of year is filled with love, hearts and lots of rose colored ribbons. After the holidays, things usually get a little drab around the house. It doesn’t have to be… let’s celebrate the season of love: Valentine’s Day! This day isn’t just for couples, everyone can enjoy Valentine’s with friends and their family. After all, it’s a day for love in general. Recreate this inexpensive, yet wonderfully unique Valentine’s gift idea! Flowers will fade, but not this DIY craft. 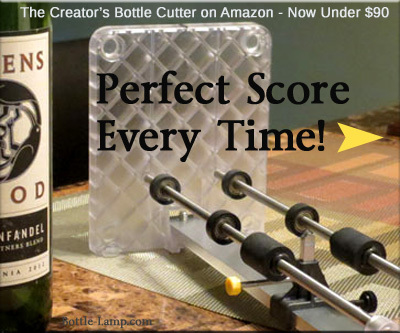 Simply cut the neck off a wine bottle. 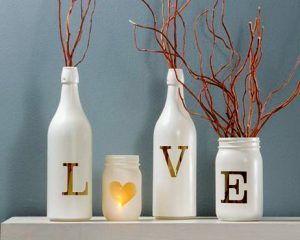 Paint the outside of the bottle, or leave the wine label intact, fill with twigs or small branches and decorate with hearts and/or ribbons. If you know how to knit you could even make little hearts like the ones in the picture above. 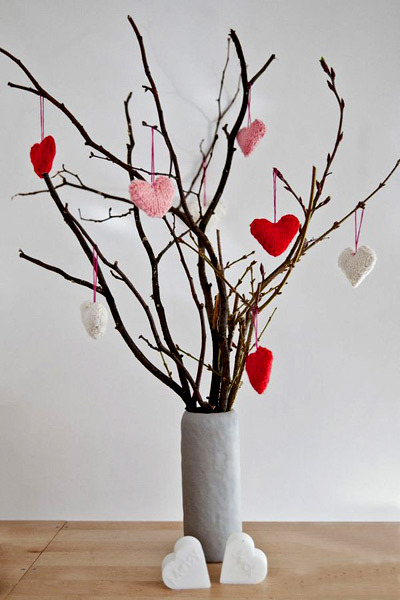 Here is an equally easy decorating idea for Valentine’s Day! Apply a vinyl letter or icon on the outside of your recycled bottles then use spray paint in your favorite color. White or metallic colors work best. Fill your bottles with a string of lights or LED candle and decorate with twigs. 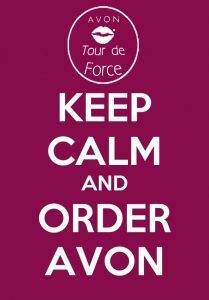 This is perfect for decorating a fireplace mantle, window sill or to place on your steps. These chalk board bottles could be a special gift or for your home decor! Here is an alternate version of our chalk board bottle. If you can’t find the right words, simply use a vinyl heart sticker before spray painting your recycled wine bottle. Then fill the bottle with candy or little treasures and decorate with ribbons, hearts and flowers. 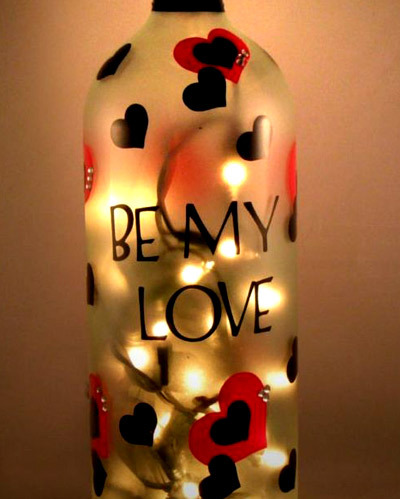 A lighted bottle lamp makes the perfect Valentine’s Day gift! 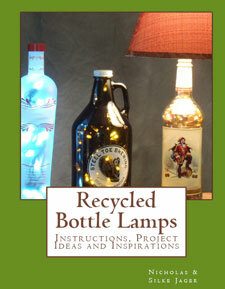 Of course we have to include a lighted bottle lamp in our Valentine’s inspiration lineup. A recycled glass bottle filled with a simple string of lights and some fun Valentine’s decorations make for a gift your loved one will enjoy all year round. It’s perfect for a night light on a dresser or hallway table. Share a special memory with your loved one! 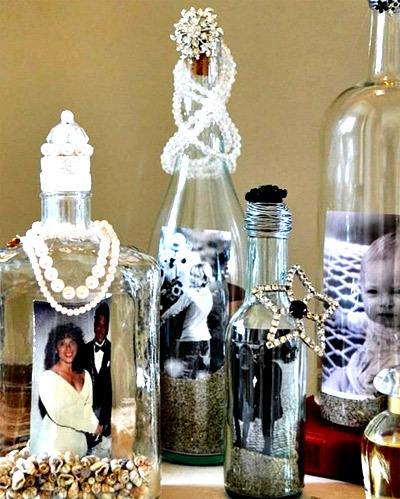 Using a recycled glass bottle is a wonderful way to preserve and share a special moment in time. You could use a picture of your wedding day, a fun date, a romantic getaway or a snap shot of your child(ren), pet(s) or favorite hang out. Which ever visual image holds special value for you is the one that should go inside your specially decorated keepsake bottle. You can find many of the necessary supplies for these craft ideas on our Resources page. DIY gifts are unique and have always been the best kind of gifts! A DIY gift is more than just a decoration or an every day object. It’s made with love, created with patience and handled with care. It’s a very personal way of saying “I love you”. 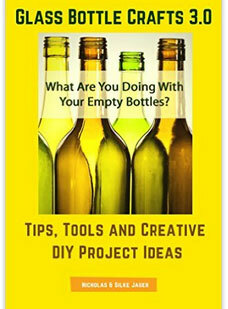 Browse our blog to find more recycled glass bottle craft ideas, project tips and inspirations. Do you have a favorite bottle idea for Valentine’s Day? Let us know in the comments below. I have been on this site for roughly 2 days and I am totally inspired! thank you for all that you share with the rest of us. Hi Billy Jo, Thank you for your kind words! We’re glad you found us and we were able to inspire you. Please send us a picture or two of your finished project(s) to share on our DIY Show Off page. We would love to see what you’ve come up with and it will undoubtedly inspire many other readers.